The weather report for Thursday is looking favourable for our gardens & dams, but unfortunately not for our morning walk! Let’s not be too disappointed if we cannot watch Mike’s ringing & walk in the Fernkloof reserve as it will mean that it’s RAINING and we need every drop of water! If you are unsure about the weather, please phone Barbara on the morning after 07:00, on 083-659-3303. There’s no stopping Lee Burman finding rare birds at Maanskynbaai. First it was a Squacco Heron, next a 90% positive identification of a Damara Tern and the latest is a Cinnamon-Breasted Bunting, which is way out of range. Lee photographed it yesterday, calmly feeding at the side of the road. Not a good quality photograph, but good enough for identification purposes. Keep them coming Lee! The Squacco is still at Maanskynbaai, along with a Purple & Grey Heron and 12 other species. In front and to the West of the bird hide were 50+ African Spoonbills and 50+ African Black Oystercatchers. Our monthly morning walk in Fernkloof on Thursday 3rd May at 08:00. Weather permitting, Mike Ford has agreed to do some ringing in the gardens and we will watch him at work while he answers some of your questions about bird ringing before we set off for our walk. Sunday 6th is the start of National Bird Week and the bird of the year is the African Fish-Eagle. 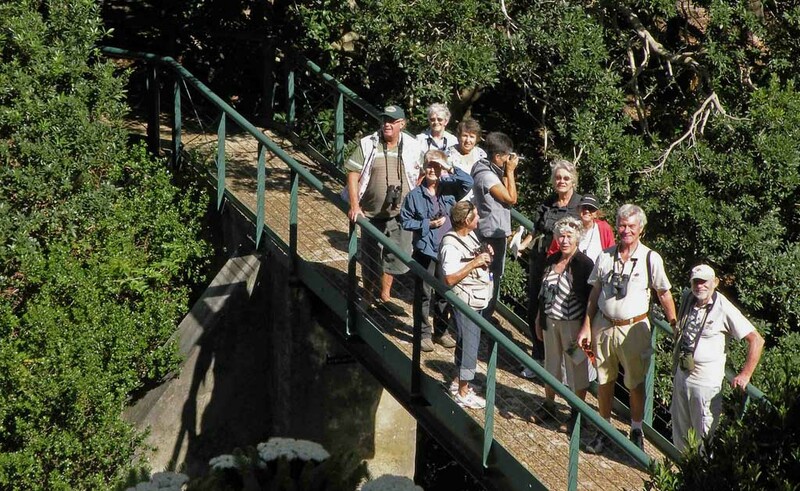 During this week (Wednesday 9 – Friday 11) a group of lucky applicants will be visiting Pat Busch private reserve near Robertson on our second away outing for the year. Wednesday 16th Ronnie Hazell will do a presentation titled ‘Three trips, 117 Lifers’ which promises to be a fascinating evening. NOTE THAT THE MEETING STARTS AT 19:00/7PM – OUR WINTER STARTING TIME. Lee Burman reports seeing a Squacco Heron at Prawn Flats (to the left of the bay, where we usually see the Common Sandpiper) on Tuesday evening, 17th April and again on the 21st at Maanskynbaai at the little bay just east of the slipway. Please add any interesting sightings of vagrant, rare or beautiful birds of the Overberg and don’t forget to be specific about the location. Photos welcome. Very excited about launching the Blog to members tomorrow evening! Our April morning walk took place in gale-force winds and there was no chance of spotting a wind-blown Cape Rock-Jumper at Rooi Els. We were however entertained by a flock of 30+ White Storks circling overhead, no doubt flexing their muscles for the long trip ahead. 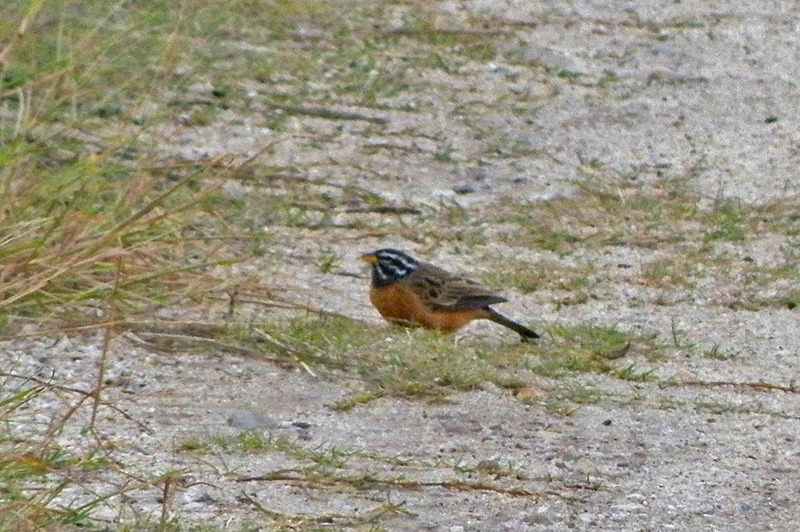 The Orange-breasted, Southern Double-collared & Malachite Sunbirds were plentiful and Cape Rock- Thrush, Cape Bunting and Familiar Chat did not disappoint. We popped in at Stony Point and ticked the Penguins without braving the wind, before heading for a more sheltered walk in Harold Porter gardens, where we had good views of the African Black Ducks, and a lonely Paradise Flycatcher and Swee Waxbill.